You didn't create any hotkeys. You need them in the first place. "Change Hotkey Keys" extension doesn't automatically create those. It allows to change already existing hotkey keys. So, you have to add hotkeys yourself. In your case you can use Lua function createHotkey. 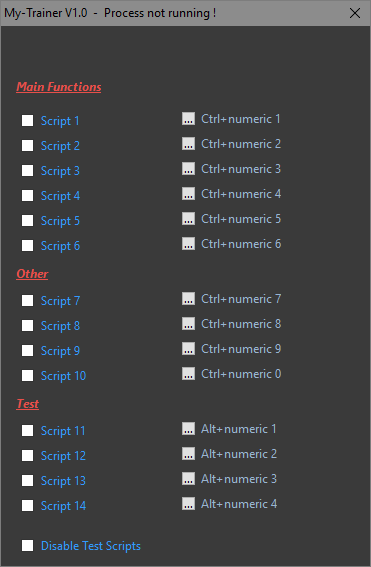 Then, instead of buttons with caption "Hotkey" just add another group of Labels or other controls with caption/text property. and hotkeysSettings('save') inside FormClose function. Also it is a good idea to move form_show(MyTrainerV1) after last addChangeHotkeyKeysFunctionality line. 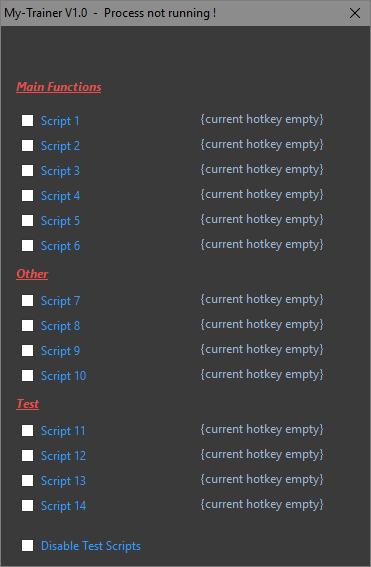 At the end I pasted my "Change Hotkey Keys" extension script at the very beginning of your script.